On June 1, 1866, Canada was invaded by a thousand heavily armed Irish-American Fenian insurgents who crossed over the Niagara River from Buffalo, N.Y. Approximately 22,000 Canadian volunteer militia were called out in Upper and Lower Canada (or Canada West and Canada East as Ontario and Quebec were known between 1841 and Confederation in 1867.) On the morning of June 2, 850 Canadian militia soldiers were deployed to interdict the Fenians near the small town of Ridgeway, approximately ten miles west of Fort Erie. The Canadian soldiers really were mostly teenage boys and young men—farmers’ sons, shopkeepers, apprentices, clerks and two volunteer rifle companies of University of Toronto students hastily called out the day before to face an invasion from the United States by Fenian insurgents bent on driving the British out of Ireland by striking into Canada. The thousand Fenians who came across the Niagara River from all corners of the United States were almost all battle-hardened recently demobilized Civil War veterans. They carried weapons with which they had intimate familiarity after fighting in dozens of apocalyptic battles in a war that had killed 620,000 Americans—more casualties than in all the wars the US fought before and since combined—two percent of the American population killed in the four year span of 1861-1865. The Canadian boys on the other hand had come from a generation that had not seen any rebellion at home or border raiding from the US since 1838—nearly thirty years earlier—and no major invasion of Canadian territory since the War of 1812—a conflict their grandfathers had fought in. Strapped by the cost-saving policies of the colonial provincial government of United Canada, many had not even been given an opportunity to practice firing any live rounds from the rifles issued to them the day before. The youths were almost entirely parade-ground drilled and led by upper-crust social-climbing gentlemen part-time officers —wealthy merchants, attorneys, professors, landlords, civil servants, politicians and entrepreneurs who saw their militia service partly as a route for social advancement and prestige, partly as a function of their class to lead the “lower orders” forward in their duty to Queen and Empire. When on that Saturday morning of June 2 they unexpectedly collided with eight hundred Fenians waiting for them at a place called Limestone Ridge, twenty-eight University of Toronto students ended up taking the brunt of the attack. The result was inventible. Two Canadian volunteer militia battalions, the dark-green uniformed Queen’s Own Rifles (QOR) of Toronto and the traditionally redcoat clad 13th Battalion of Hamilton, reinforced by two local country companies from Caledonia and York, were cut to pieces and in their panicked retreat they left their dead and wounded in the field. It was the first celebrated Irish victory over the forces of the British Empire since the Battle of Fontenoy when in 1745 the Irish Brigade –“The Wild Geese”—in the service of the French army charged the Duke of Cumberland’s elite Coldstream Guards and routed them during the War of Austrian Succession. The Battle of Ridgeway (or Lime Ridge or Limestone Ridge) took place less than a year before Confederation brought together several British North American colonies into the nation of Canada. It was the last battle fought in what would become the Province of Ontario—and it was the first battle of the modern era fought by what would become the Canadian Army. There were no British troops at Ridgeway and the battle was led entirely by Canadian officers; it tested the mettle of Canada’s ability to defend itself, by itself, in the wake of colonial military budget belt-tightening by Britain. The Battle of Ridgeway marked the beginning of Canada’s rising sense of self—the tipping point of when we stopped being only British colonial subjects and began our transformation towards becoming a Canadian people; our rite of passage for heroic citizenship in a new modern sovereign nation. ...though not one of the causes which led to Confederation, was yet one of those incidents which essentially proved the necessity of that military organization which, it was alleged, would spring from Confederation, and which was one of the first measures carried after Confederation was adopted. It exemplified in a strong degree the alacrity with which the young men of the country were ready to spring to arms at the call of duty, and intensified the devotion of her people to Canada. Cheer up, let the rabble come! And we’ll fight for our beloved Canadian home. Cheer up boys, come on, come on! A year after Ridgeway a Toronto schoolteacher, who had fought there, Alexander Muir, composed what became Canada’s unofficial national anthem—The Maple Leaf Forever. Canada had become a place and a home for its defenders—not Britain or the Empire first. Ridgeway was where we first fought for the maple leaf before the crown. It was our Bunker Hill. Ridgeway was the battle that made Canada. Ridgeway 1866! Limestone Ridge & The Maple Leaf Forever: The American Fenian Invasion and the Forgotten Battle That Made Canada looks at Canada's first modern industrial-age battle--Limestone Ridge, fought near Fort Erie, Ontario on June 2, 1866. It also describes for the first time the Battle of Fort Erie 1866, fought later that same day, a battle about which we know very little after John A. Macdonald suppressed the transcripts of an inquiry into its conduct. Based on the previously suppressed transcripts now available in Canada Archives, Peter Vronsky provides the first account of what happened in the town of Fort Erie on the afternoon of June 2, as 71 volunteer gunners and marines made a stand against 800 Fenians returning from their victory at Limestone Ridge. 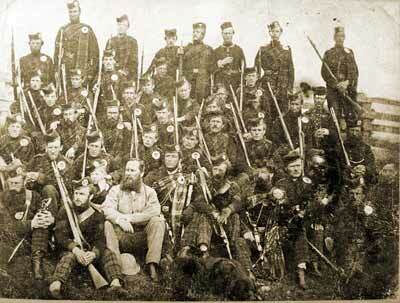 Ridgeway 1866! 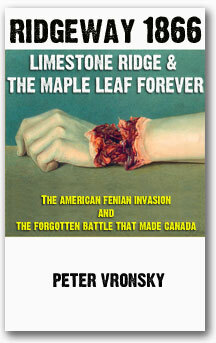 Limestone Ridge & The Maple Leaf Forever: The American Fenian Invasion and the Forgotten Battle That Made Canada looks at the rise of the Fenian invasion threat and the origins of Canada's army and secret services during the American Civil War era - 1861-1865. It describes the Battles of Ridgeway and the two whitewash Military Courts of Inquiry and concludes by tracing how the memory and meaning of the battle and its sacrifices were scrubbed from Canadian history and its founding traditions in the three decades following the battle, until in the 1890s Ontarians began spontaneously decorating with flowers the graves of Canadian soldiers killed in the Fenian Raids. June 2 became "Decoration Day" and after the First World War, Canada's national memorial day until 1931, when November 11 Armistice Day became the memorial "Remembrance Day." Toronto Globe, March 28, 1923. Another version of the song had a chorus that went, “Shout, shout, shout, ye loyal Britons” instead of “Tramp, tramp, tramp, our boys are marching” contrasting the Canadian version.